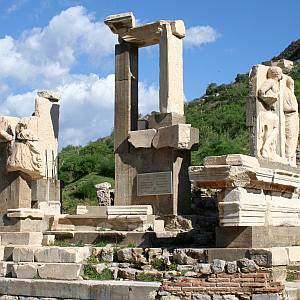 Inside Ephesus Ancient city, you are going to visit: Odeon, Domitian Square, Memmius Monument, Nike, Hercules Gate, Curates’ Street, Trajan Fountain, Latrines, Brothel, Library and the Grand Theatre. Turkey is the home of significant arts produced by earlier cultures. Carpet weaving art traveled to the western part of Turkey with the Turkish Nomads from their Central Asian homelands and designs varied from village to village. Turkish rugs are among the most well known and oldest hand crafted art works in the world. The oldest carpet is the famous Turkish Pazyryk Carpet, dating back to the 5th Century B.C. After visiting Ephesus, you can enjoy to learn something about one of the oldest art making on the world with visiting the Ministry of Tourism and Culture course. Demonstration of the silk-making process in the workshop also will be very interesting and educational. The art of Turkish tiles and ceramics roots can be traced at least 8th and 9th centuries and it has been developed over the centuries incorporating many different techniques and styles. Near Ephesus there are private workshops and educational institutions to keep the art of traditional Turkish tiles and ceramics alive. You will have a chance to visit one of them to learn and try to make this art. You will enjoy to learn about coloring and designing the white baked clay.